Plato, with Socrates and Aristotle, is the founder of the Western intellectual tradition. Like his mentor Socrates, he was essentially a practical philosopher who found the abstract theory and visionary schemes of many contemporary thinkers misguided and sterile. He was born about 429 BCE in Athens, the son of a prominent family that had long been involved in the city's politics. Extremely little survives of the history of Plato's youth, but he was raised in the shadow of the great Peloponnesian War, and its influence must have caused him to reject the political career open to him and to become a follower of the brilliantly unorthodox Socrates, the self-proclaimed "gadfly" of Athens.Socrates' death in 399 BCE turned Plato forever from politics, and in the next decade he wrote his first dialogues, among them Apology and Euthyphro. At age 40, Plato visited Italy and Syracuse, and upon his return he founded the Academy-Europe's first university--in a sacred park on the outskirts of Athens. The Academy survived for a millennium, finally closed by the emperor Justinian in 529. Plato hoped his school would train its pupils to carry out a life of service and to investigate questions of science and mathematics. Plato's old age was probably devoted to teaching and writing, he died in Athens in 348 BCE. Benjamin Jowett (1817-1893) was an English classical scholar, theologian, and translator. At the University of Oxford, he was the prestigious Regius Professor of Greek and master of Balliol College. Jowett had a reputation of being a great tutor and is now best remembered for his translations of Plato and Thucydides. 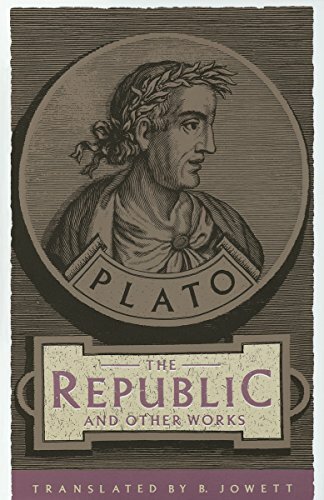 A compilation of the essential works of Plato in one paperback volume: "The Republic, The Symposium, Parmenides, Euthyphro, Apology, Crito, and "Phaedo.